• High signal transfer accuracy and repeatability. • Advanced circuitry provides very low heat dissipation, ensuring modules run cool despite their high density and functionality. • SMD manufacturing for long, reliable life. • Complete absence of electrolytic capacitors ensures minimum 20 years lifetime. • Wide range of digital and analog I/O. • Three port galvanic isolation to eliminate noise, ground loop problems. • Line fault alarm detects open or short circuit of field cables. 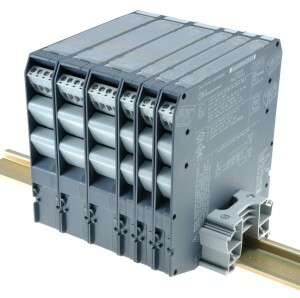 • Optional power bus DIN-Rail connector. • Standard Termination Board with SUB-D connector and customized Boards compatible with major I/O cards. • Modules suitable for applications up to SIL 3 level according to IEC 61508, IEC 61511. • Independent power supply circuit for each channel. • Dual channel units are equivalent to two single units because of the absence of common circuitry. • Single channel versions available when required, to provide single loop integrity . • Configuration components are easily accessed by removing the side cover. • DIP switch configurability for easy field setup. • LED indication for power, signal status and line fault conditions. 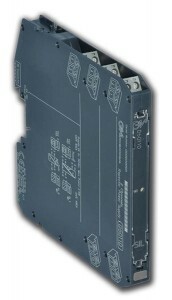 • Modules accept DC power supply over a wide range for 24 Vdc (20-30 Vdc) applications. • Wide operating temperature range: -40 to +60/+70 °C. • 35 mm (Top Hat) DIN-Rail. • Termination Board mounting modules. • Power and fault on bus connectors.